Nex Machina is a modern revamp of Robotron 2084 in all but name, and developer Housemarque even managed to collaborate with Robotron’s creator, Eugene Jarvis, to bring the high-quality homage to life. Conceptually, the two games are nearly identical, and every aspect of Nex Machina is appropriately chock-full of nostalgia; the gorgeously trippy graphics feel simultaneously modern and retro, and the synth-wave soundtrack complements the sci-fi action perfectly. In the same vein as Pac-Man Championship Edition, Nex Machina is one of the best modernizations of a classic arcade game that you can find. The plot is brief and to the point: you’re a lone hero trying to save what remains of humanity during a robot apocalypse. The twin-stick shooting action that defines your fight is tight and responsive, and every world is relentlessly challenging. Individual levels are relatively small, fast-paced, and frequently packed with secrets to discover amidst the chaotic hero-on-robot action. And death comes instantly, whether you get hit by a lone bullet or simply bump into a nearby enemy. Nex Machina’s pronounced difficulty is by design, hearkening back to the challenge of its arcade source material. Beyond advancing through stages, skillful play is rewarded with item upgrades, bonus points, and a strong sense of satisfaction from overcoming seemingly impossible odds. Nex Machina is consistently challenging, but it’s also thoroughly gratifying as every power-up gives you newfound confidence in the heat of battle. Your primary objective in each level is to destroy a number of enemy waves before rocketing off to the next set piece. There are, however, numerous secondary objectives to consider along the way. As with Robotron, there are a handful of humans haplessly wandering around each stage. Rescuing them (just by touching them) requires precise timing as you must not only protect your own hide, but also defeat enemies who’re whittling away the wandering humans’ health. Saving humans is considered optional, but it’s a relentlessly tempting (and risky) distraction that you’ll chase time and time again, even when you should know better. Boss battles at the end of every level are the biggest test, throwing out dense curtains of bullets that demand exacting movements to avoid. 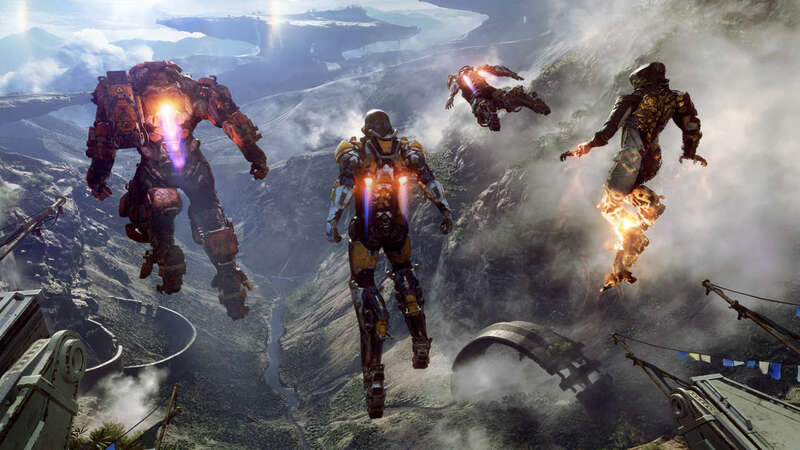 All are challenging, and each is drastically different–from a mechanical ape that sits at the top of the screen and throws flaming debris at you, to a giant Terminator-like Skull and a hivemind boss that attacks from the safety of a protective field. Adding to the challenge, boss fights follow a series of dense enemy waves; if you lose all of your lives and end up using a continue, you have to start the process all over again. You can point to dense waves of enemies and monstrous bosses as the reasons Nex Machina is so hard, but more than their numbers or size, it’s the range of tactics they employ that ultimately stress you out. Some enemies mindlessly plow toward you, others will make beelines to humans, and there are burrowing turrets that send out waves of exploding balls, among a variety of other robotic dangers. You typically face myriad enemy types at once, from all directions, creating a juggling act that would be impossible to contend with if not for your special abilities. Dashing is central to surviving in Nex Machina’s harsh world, as it was in Housemarque’s previous games, Resogun and Super Stardust. Once activated, you’re invulnerable for the duration of the lunge, and your timing has to be perfect given the small margin for error in most levels. Misjudge the duration of your dash through a crowd by a nanosecond, and you’ll lose a life. Since there is a brief recharge period between dashes, you can’t abuse it. This is alleviated somewhat if you spot and grab a triple-dash power-up, but these are few and far between and don’t completely diminish the risk of an untimely sprint in the wrong direction. Secondary weapons, however, are more prevalent and can make or break you depending on the scenario. Your options include powerful lasers, rockets, floating bombs, and a sword for deadly close-up attacks. These also require a brief pause to recharge, reinforcing the idea that your ability to manage cooldown meters is a critical skill–and another layer to track during frantic onslaughts. You can, in theory, play through Nex Machina in under an hour, but it’s eminently replayable thanks to the number of secrets waiting to be found, and the skills you need to hone in order to survive and climb to the top of the leaderboards. You do have the option of bringing a friend along, but Nex Machina’s multiplayer is woefully limited to local engagements. The lack of online play is a notable disappointment given how useful a partner can be on the game’s harder difficulties. 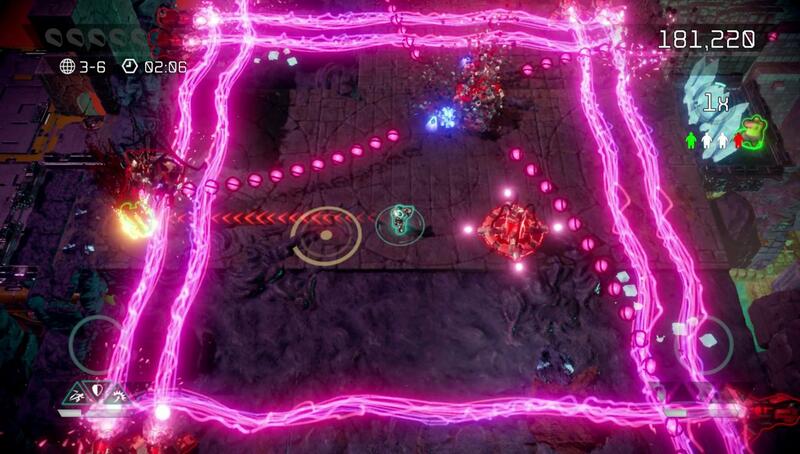 Limited multiplayer options aside, Nex Machina is a game that confidently meets expectations. It’s difficult, intensely satisfying, and packed with enough secrets and lofty secondary objectives to keep you enraptured for hours. It’s a classic game at heart, but with refined challenges and exacting mechanics, it feels right at home in the modern era.